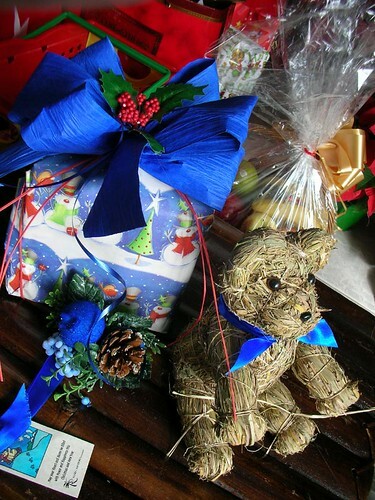 felis pasgua yan añu nuebo; may you have a warm, wonderful and blessed christmas season. i'm off to manila, so i'll see y'all in the new year! i've been pretty good about staying away from the sweets and treats i've been baking and those that have been given as gifts, but all this running around has made me hungry! my big overindulgence this holiday has been eggs--poached, boiled, fried, scrambled, salted, you name it. it's sort of funny because during my college days i was not a fan of eggs at all, and recently i've had a bad case of mayonnaise aversion. but i've been having one a day for the past week, and i can feel the cholesterol sludging up my system, so i know i better cool it and soon. still, there's something about a warm runny yolk on a pile of hot rice, a soft-boiled egg smashed onto a chunk of buttered wholemeal toast, or egg whites with a bit of sea salt and fried minced garlic....mmmm. 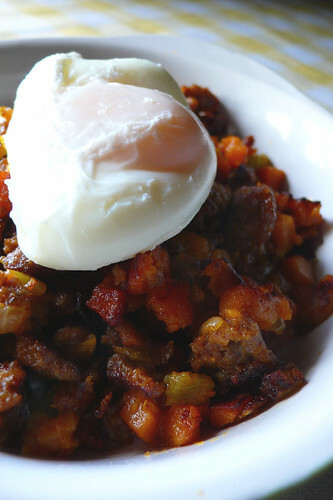 so then two of my favourites: a chorizo hash with sweet potatoes and white potatoes, onion, celery and carrot, topped with a poached egg. simply chop everything up, crumble the chorizo, sautée and yr done. a little harissa adds a little complexity to the kick, but it's fine on its own. 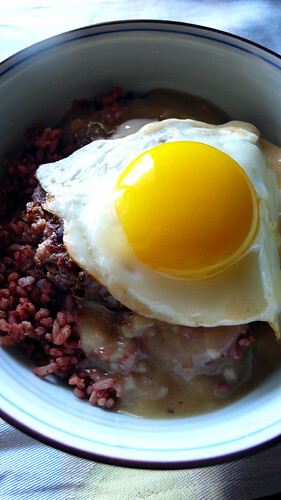 and of course, the loco moco, made a little more luxurious with a grilled sirloin beef patty on steamed red-grained rice, topped with a fried egg and gravy made with oxtail and shank stock. after making a standard roux i whisked the hot beef stock into the mix until it became a thin gravy; i shredded some of the oxtail and shank meat, added it in and seasoned with salt and pepper. really, nothing to it workwise, but flavourwise, it's on a whole 'nother level of loconess. gaah, where has the time gone? 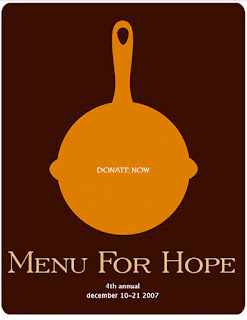 recipes in a bit (maybe after xmas if you'll forgive me--'tis that time of year after all)! i don't think i've ever made a fruitcake before. i've never been a huge fan of it, but i've had some that have been very good, so i'm not of the type who chucks it out of windows when one crosses the threshold--mainly because most of them are so heavy, i'm sure to kill an unsuspecting passerby. i do, however, get the urge to bake them, even though i know they are a hard sell. i brought one to the guys at the bank today and they were all like, "so what goodies did you bring us today?" and i carefully said "oh. a cake." pause. "with fruit." dingdingding! oh, the disappointment and the accusation hanging in the air! "a fruitcake?!" so anyway. i've never read steingarten's book, don't really know the exact mods that annie did to his cake, and there's talk of some sort of "fatal flaw" in the crust. i wasn't worried too much about it, though, because the ingredients list reads like a french pound cake recipe with the addition of a lot of stuff--i can do that. the french pound cake--quatre quarts, literally "four fourths"--is made with equal amounts of four ingredients: flour, eggs, butter, and sugar; only a little variation on that, and some advice taken from one of the dozens of googled fruitcake recipes i've looked at for weeks: the addition of 3.5 pounds of fruit. yeeeeeeahboyyyy. can't mistake that for anything else then. i used a mix of dried and candied fruits, chopped them up to 1/4-inch anonymity to protect the innocent, which made the cake more like a jammy poundcake than dough studded with sugary unidentifiable lumps. walnuts added some needed texture, and like annie and jeffrey, i didn't bother to liquor it up. didn't need it. also didn't get the hard crustiness as described by both, but i baked them in smaller loaves, so the cooking time was reduced significantly; what i got was a beautifully golden, sugary-coated shell that made the cake irresistible directly out of the oven. of course, all that fruit and sugar makes it molten-hot, so perhaps you'd like to wait for it to cool completely, or even refrigerate it for easier slicing. i know you're sceptical, but i stand by it, like i stand by mariah carey's christmas song--it's sugary, it's sweet, it's definitely seasonal, but it also has substance, quality ingredients, and darn it if it doesn't make you want to dance around the christmas tree. oh, you humbuggers you. here's some darlene love for you then. in a large bowl, combine all fruit and nuts, mixing well. set aside. cream butter and sugar together until light and fluffy. add eggs, one at a time, beating well after each addition. add vanilla and salt. fold in flour until completely incorporated. mix fruit/nut mix into batter. transfer batter into well greased pans. bake until golden, and toothpick inserted in center comes out relatively clean (roughly 35 minutes for small muffins, 1 hour for small loaves, and 2 hours for large ones). 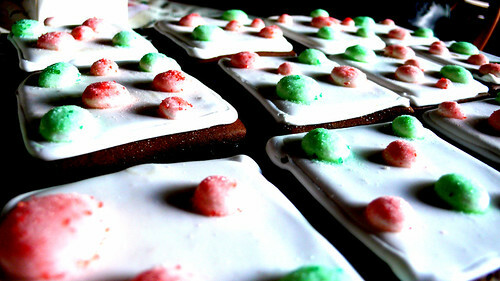 has caused my gingerbread cookies to break out in hideous, sugar-encrusted boils. i am at the tail end of a cookie baking marathon--mexican wedding cookies, an odd hazelnut chocolate cookie with which i was experimenting, and chocolate chippies. new to this year's lineup: bill clinton's oatmeal cookies, from chef sherry yard's "desserts by the yard." i make a lot of oatmeal cookies, and even though they don't look like much (when do oatmeal cookies ever do? ), they might be some of my favourite--possibly the only favourite anything i share with the former president. 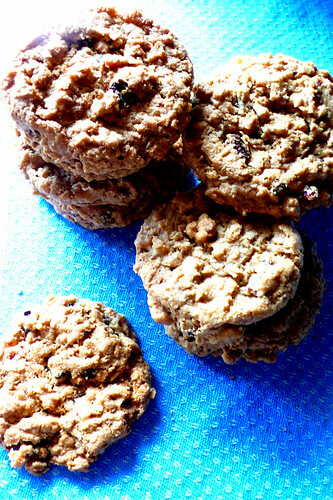 they are crispy on the outside, but chewy with oats, brown sugar, and wine-soaked golden raisins (i added some dried cranberries as well) on the inside. you can futz about with the temperature and time if you want a softer, chewier cookie, but imho, they don't turn out quite so well. stick to the plan, stan, and enjoy. three years of giving, almost $100k in total going to worthy charities. it's time for the fourth campaign, as spearheaded by the lovely miss pim. money this time goes to the UN world food programme, for the school lunch program in lesotho, africa. chez pim has all the details on who gets the money and how you can contribute. prizes galore for your generosity! you can also check out grab your fork for the asia pacific prize roundup and all the deets as well. yes, it's from heem again, what of it? with the way things are going this holiday season could be a ludo christmas or a ludacrismas --it could go either way. it's (eeeep!) only tweeks away from the 25th, and i'm still trying to decide what my christmas cake gift will be. truth be told, i'm not entirely sure anyone around here appreciates gingerbread, spice cakes, or fruitcake, but i so want to do one. or all. or, in the case of this ludo recipe, a spice and fruitcake rolled into one. it is a simple recipe, despite the 20 item ingredient list; the majority of those are spices, and only in small quantities. rather surprising to me, though, is that ginger is not one of those ingredients, but with fresh orange and lemon peel, star anise and cloves among them, who needs it? also unnecessary are eggs and fat--this is a dairy-free dessert. unlike many of the other pain d'epices receipts i have found, this one has candied fruit in it, making it very much a fruitcake. i substituted traditional glacé fruits with a dried fruit blend to great effect--the candied texture is still there, but with much less sweetness. there is also a bounty of pistachios, hazelnuts, and almonds within. once all the ingredients have been assembled--dry items in one bowl, wet in another, nuts and bolts to the side--it really comes down to just mixing them all and baking, in the easiest possible way. whoo! 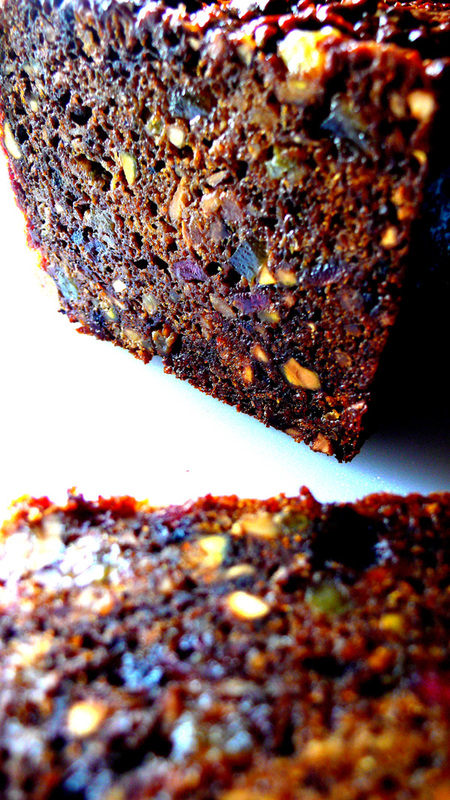 the cake is dark, dense, moist, intensely aromatic and flavoured; a thin slice is better than a thick one to savour all the flavours going on within it. i find it exotic and appealing, very we-three-kings frankincensey and jewellike. 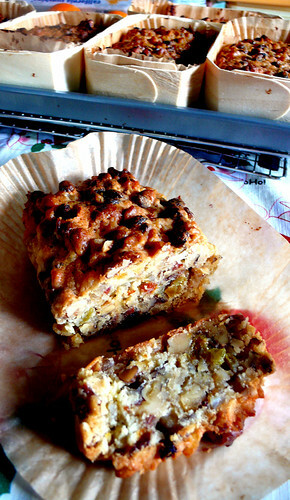 however, the gingerbread jury thought otherwise: "omg, is that a fruitcake?! bleurgh" or "blarrgh! wtf? is there cumin in this?!" pfftpfftpfft. why, ho ho ho, yes, there is cumin in there--a mere fraction of a teaspoonful--but apparently enough to make staunch cuminyfruitycake-haters fuel up on haterade (who knew there would be so many). *sigh* i could leave out the cumin. or, get new friends. but do i really want to do either? okay, now that i've got the figs, what do i do with them? 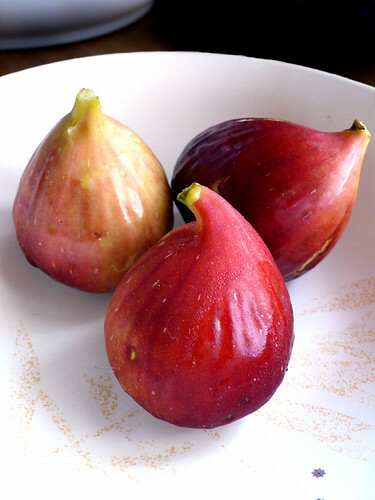 i've looked at a bunch of figgy pudding recipes but they all seem to call for dried figs. does anyone have a nice recipe for fresh ones (pudding or otherwise)? about a year ago, i bought a little fig tree cutting from a local growers' market. 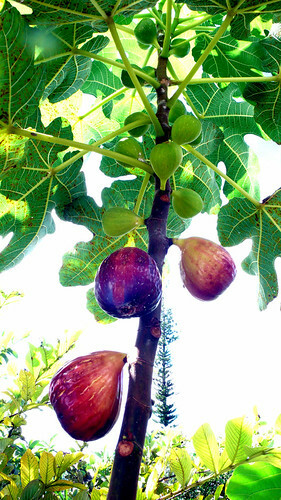 i was surprised to see it there, because i didn't think figs grew in tropical places, mainly because i never saw fresh figs in the market, nor any recipes utilizing them. the grower really didn't know anything about it, except that he had always had trees on his family's land; however, he had never actually tried the fruit, and wasn't sure if it was the same as any of the varieties sold in mainland markets or if it was some sort of asian variation. so, i took it to my parents' house and my dad planted it in the backyard. i didn't hold much hope for it, but it grew steadily, and even managed to produce a couple of fruit sporadically over the next couple of months. i didn't really think about it much, but lately i've realized that in the past year, the tree is now over ten feet tall, and is finally yielding enough fruit to actually use in a recipe. whee! i figured it was time to actually look up what kind of fig tree it is. i still don't know, but found another surprise: fig trees--Ficus carica--are believed to be native to western asia, distantly related to breadfruit (Artocarpus altilis Fosb. ); jackfruit (Artocarpus heterophyllus Lam. ); and chinese mulberry (Cudrania tricuspidata). it is a deciduous tree that is typically ten to 30 feet in height, but can grow up to 50 feet. the branches are soft, twisty and vine-like, spreading wide rather than tall. the leaves are bright green, fuzzy, have an easily recognizable shape and grow out to nearly a foot in length. the fruit has a thin peel of varying colours (from green to dark purple), with and interior white rind holding in a mass of gelatinous seeds. they must be left to ripen on the tree, but once picked they only last for a few days. yes, i know it doesn't seem like i know any other holiday-esque adjective besides "merry" but yah maybe i don't. 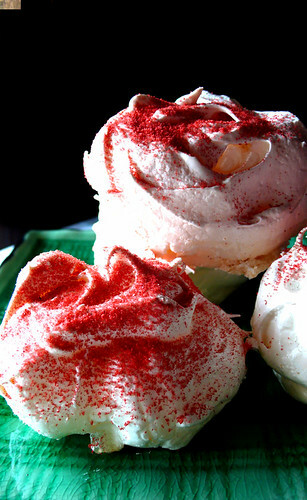 i saw big, beautiful raspberry meringues on doc18's flickr photostream, and found them very appealing. doc18's meringues were from ottolenghi in london; i've never been, but it looks very much like a place i'd like. however, it doesn't look like i'll be getting to the uk any time soon, so again, i must make do with make at home. upon some reflection, i've realized i don't really like meringues all that much, but i do like aspects of them a lot--fat freedom and texture mainly; that they are overly sweet and not particularly flavoured with anything, not so much. also, i wasn't very good at making them. however, with a little patience, a vat of egg whites, and some help from baking 911, i've learned some tricks for success in a humid, tropical kitchen. the main thing, of course, is to try to keep the humidity at bay, but making a swiss meringue--which cooks the egg whites and sugar before beating--allows for the sugar to melt thoroughly (no graininess or weeping--on the meringue's nor cook's part), and stabilizes the mix more for a lighter, fluffier texture. also, in more humid climates, longer oven times are necessary, but at a lower temperature--lower, slower. whoo. barry white meringues! still working on flavour. vanilla is nice, but want more variety. 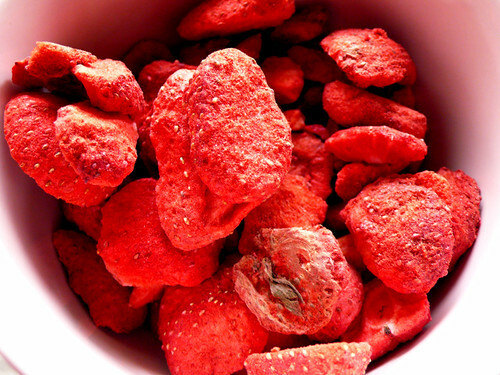 for these i simply whirred some freeze-dried strawberries in a food processor to make a ruby red dust for decoration and a bit of tartness. holiday gorgeous, certainly, but if anyone has any other flavouring suggestions, please let me know! preheat oven to 300˚F. over a pot of simmering water, stir the egg whites and sugar together until the sugar melts and the mixture feels quite warm (but not hot!). add vanilla and salt. take the mixture off the heat, and whisk (or use a mixer) until thick, glossy and doubled in volume. plop big blobs of the stuff onto a parchment lined baking sheet, then bake in oven for 1-1 1/2 hours. drop the temperature to 250˚F, bake for another 1-2 hours, then turn off oven. leave the meringues in oven overnight to continue drying. makes 4 to 6 big bazonking meringues. During Hanukkah, Jewish people celebrate the miracle of the tiny bit of oil that miraculously burned for eight days. This miracle is remembered by lighting a menorah for eight days and eating fare cooked in oil or laden with cheese. um, i think there might be more to it than that. but hey, food is important in religious holidays--that a celebration should include deep fried dough and dairy goodness can only be a good thing, right? this isn't fried in oil, but it is definitely laden with cheese: a dark chocolate chocolate chip cheesecake from the whimsical bakehouse by kaye and liv hansen. 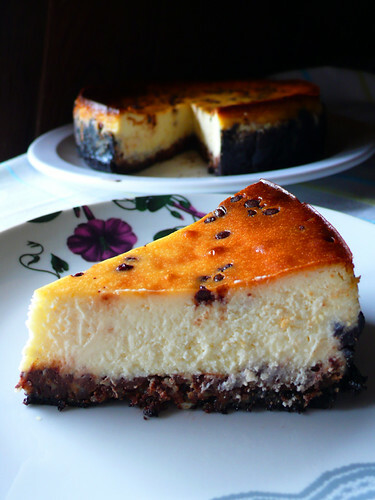 the recipe was adapted from this mocha chocolate chip cheesecake--just omit the espresso. also, all the fiddly decorative bits and chocolate glaze are nice but unnecessary--this cake is good enough on its own. it is creamy, not too sweet, rich, but not too heavy. a lovely addition to any holiday feasting. the simplest of ice cream recipes, as brought to you by the man, made slightly more festive with the addition of milk chocolate covered rice crispy bits. 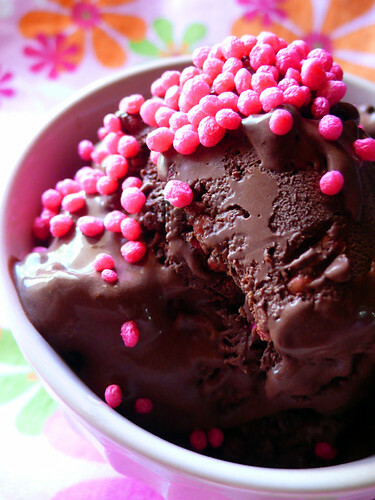 the chocolate coating helps keep the puffy rice crispy, and adds a lovely bit of light texture in this velvety rich ice cream. if you don't have the powdered milk, you can leave it out. if you don't have an ice cream maker, just pour the mix into a zippered freezer bag, then place in the freezer; squish it about every half hour or so until it has a soft-serve like consistency. to make the chocolate rice crispies, melt a bar of milk chocolate (i find leaving it on my car dashboard to be the most effective method--if that's not in your plans, try one of these methods), add approximately one cup of puffed rice cereal to the slightly cooled chocolate, mixing gently until coated well. spread out onto wax paper or silpat sheet to cool, then fold into the prepared ice cream. 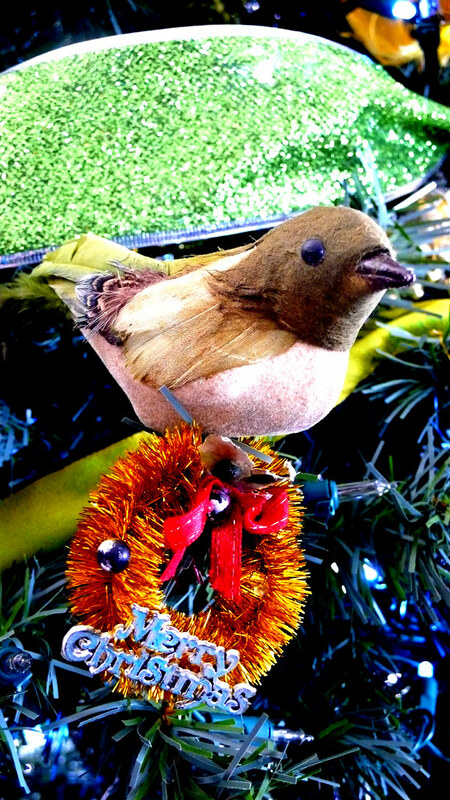 miss zarah of food and thoughts is in the holiday spirit and planning on offering a new post for the next 24 days. i love the idea of her christmas countdown, but doubt that i can match her largesse. however, it doesn't hurt to try, does it? so, hopefully, for the run up until the 'mas i will attempt to double my output--from one post a week to at least two. >gasp< i know. it's mind-boggling, innit. i've just read that cathy from my little kitchen plans to join in as well--anybody else up for the challenge?